Rain will get heavy at times tomorrow morning and afternoon as a frontal boundary pulls through ahead of an impending nor’easter. Forecast models have been trending West with the nor’easter. It is looking very likely that scenario 3 (see past post) is going to come true. The low is expected to move off the Delaware coast and hug the coast. Rain will fall much of the time as the cold air just will not be able to wrap around the storm in time. As the storm is pulling out, I expect the rain to change to snow late Wednesday night for a 4-5 hour period. 1-3 inches of slushy wet snow should fall around the I-95 corridor, with 3-6 in the Lehigh Valley and areas north. There are a many weather junkies (including myself) who are willing to “nowcast” (forecasting as the storm happens) and disregard the models for this storm. 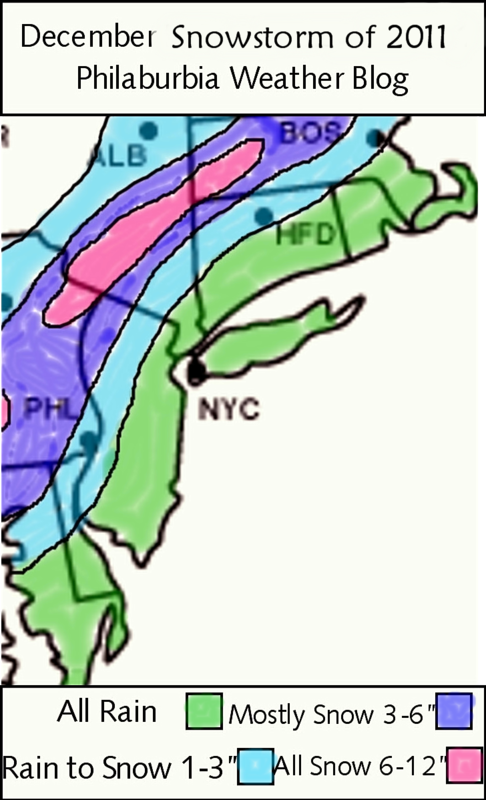 The forecast models have had an extremely hard time and may not be portraying the rain/snow line correctly. The words, “dynamic cooling,” are crucial for the early changeover to snow. In simple terms, dynamic cooling is like continually putting ice cubes into a cup of water. The water will eventually cool down to near freezing, even though the initial temperature was above. We encountered major dynamic cooling during the Halloween storm: When the snow started falling in the morning, it slowly dropped the temperatures to freezing, making the changeover to snow much earlier than any model had anticipated. This is what I am concerned will happen with this upcoming storm. I will continue to watch what develops later tonight and throughout the day tomorrow. Stay tuned! My spouse and i got relieved Edward could finish off his reports from your precious recommendations he discovered out of the site. It’s not at all simplistic just to always be giving out helpful hints which usually others may have been trying to sell. So we figure out we now have you to thank because of that. The most important illustrations you made, the easy website menu, the relationships your site aid to create – it is many remarkable, and it’s really assisting our son in addition to our family believe that that matter is pleasurable, and that’s incredibly vital. Many thanks for all the pieces!